Henry Holt and Co. (BYR), 9780805079579, 80pp. It is the first annual meeting of the WOOF Society. Dogs of all different backgrounds and breeds have gathered together to listen to the diaries of twelve dogs from around the world and throughout history. Abu is the ruler of ancient Egypt, but Miu, the Royal Cat, continues to challenge him, except at night. Tidbit, born the runt of the litter, becomes a star singer at the Grand Ole Opry. Jip leads his blinded master back home from the Civil War. Mimi, a dog living in Paris, shares her tips on bathroom protocol and dinnertime etiquette. And eight more! 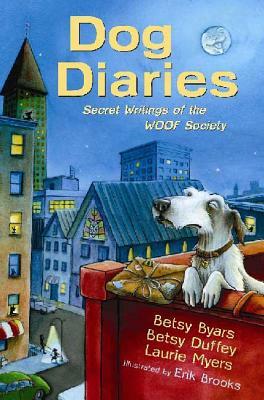 Betsy Byars and her daughters, Laurie Myers and Betsy Duffey, the trio who brought you MY DOG, MY HERO and THE SOS FILE, have pooled their talents once again to write on a subject they love. DOG DIARIES is a collection of humorous and touching stories, complemented by Erik Brooks' black-and-white illustrations, that will appeal to dog lovers of all ages. Betsy Byars, a Newbery Medal winner for The Summer of the Swans, is the author of many revered and popular books for children. She and her husband live in South Carolina. Betsy Duffey lives in Georgia. Laurie Myers lives in Georgia.